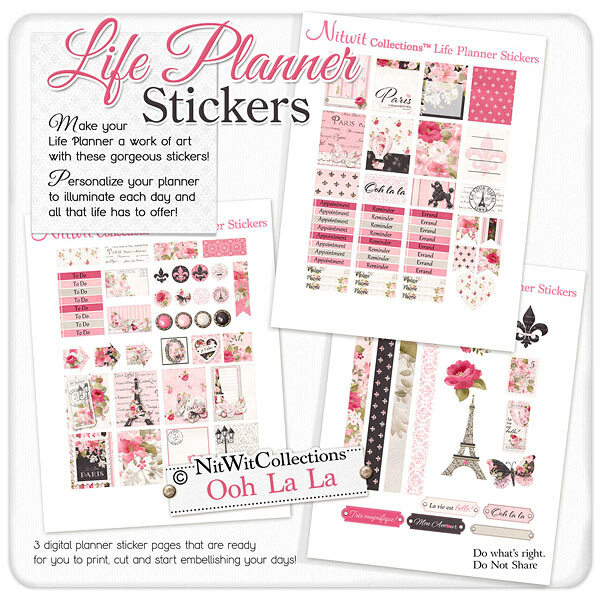 "Ooh La La" Life Planner Stickers is a cottage chic digital sticker kit that will whisk you away to the City of Love!! Stroll through the display and let the sights of the Eiffel Tower, hot air balloon, beautiful flowers and lace hearts guide you towards creating your planner pages that take you away to a place of love and lavishness! These digital sticker sheets fit most popular planners....all you have to do is download, print and cut and you're ready to create and decorate your planner however you see fit with the multitude of options that these sticker sheets offer. You receive your downloads in pdf, jpg and png formats. 16 - 1.5" x 1.9" full boxes adorned with so many distintive styles and colours that they will conjure up memories without even booking a flight! 1 - Heart element with sweet little flowers...can you say quintessential love??! 3 - Square embellished tags...can you see these in the perfect place in your planner?? 1 - Flower in full bloom...maybe the perfect top for a bookmark or possibly it is your birthday this month and who doesn't deserve flowers?! 1 - Stamp element that you just have to use!!! 1 - Eiffel Tower element...how can this not conjure up images for you?! 1 - Butterfly to let your planner pages take "gentle flight"
1 - Blank word tag for you to fill in with whatever inspires you!